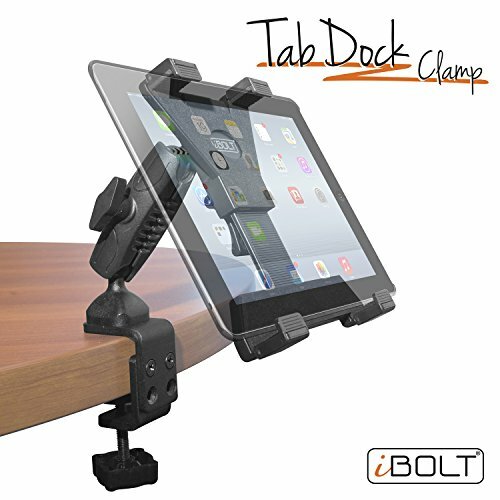 HEAVY DUTY - The TabDock Bizmount Clamp is a heavy duty C-Clamp pedestal mounting solution for Tablets. It is designed to install directly on a table, cart, wheelchair, desk, etc. The Bizmount Clamp allows you to mount your tablet where you need it most. GREAT FOR BUSINESS OR PERSONAL USE - Works with most smooth surfaces, up to 2.5" wide. The C-Clamp mount can be adjusted to fit your desks, or tables width. The Dual-Ball Adjustable mount is 6" tall and is great for business, homes, or schools.